They say time flies, and it has never been truer. In June of 2016 I began a journey and I didn’t know where it would lead me. I started working at AIHFS primarily with the Sacred Bundle Program, The Youth Program, Cultural Services and the Healthy Start Program. I also worked on projects that included members of the Behavioral Health Department. I have learned so much and I am so grateful to be able to look back on this year and share a few of my experiences with you. 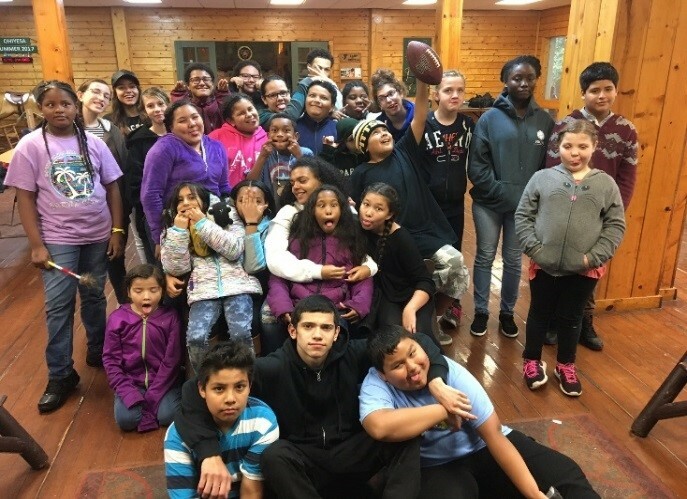 Fall camp 2016 with the Youth Group: it was an amazing experience, connecting with the youth, making fun crafts including the awesome mocs I learned to make. I remember my first day working at the agency, I was sitting in the Admin building, doing training, and meeting almost everyone who was on staff. I toured around the agency learning where everything was and meeting everyone in the pod, front end, medical, basically everywhere. I have learned lessons from the people and programs here. I never thought sitting in that desk and taking the tour would lead me to the journey I was on. The lessons I have learned are priceless gems that I will always carry in my heart no matter how far I travel from AIHFS. I have learned the kind of woman that I want to be; I want to be a woman who exemplifies traditional values; love, wisdom, humility, respect, honesty, truth, and bravery (check out this link for more info on the 7 grandfather teachings http://ojibweresources.weebly.com/ojibwe-teachings–the-7-grandfathers.html) . I choose to love unconditionally, acquire wisdom every day, be humble in all endeavors, respect myself and others, be honest, be truthful in all aspects of life, and to be brave in every step that I take. These gems are not only a part of my memories but they will forever be a part of my spirit. I have also acquired amazing skills that I will always have moving forward. I was able to attend trainings and receive certifications in SafeTALK, ASIST, and Youth Mental Health First Aid for the roles I have filled here as a leader for the youth group, a Sacred Bundle Screener, but most importantly an active member of this community. If you are interested in learning more about those trainings or in attending them, contact Lauren Lockhart, our Sacred Bundle Program Manager, at llockhart@aihfs.org or Karen Marshall, our Training and Outreach Coordinator, at kmarshall@aihfs.org . Also, for more information, check out these links! I have learned skills that are part of my culture as a Muscogee Creek Nation woman. 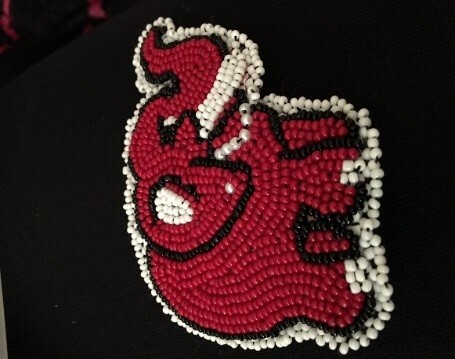 One skill that I have learned that has been very valuable has been beadwork. I wrote a blog last month about beadwork specifically and my growth and skill in this art over the last year is really mind blowing. I am so honored to be able to do the art of my ancestors. Above is my first ever beading project from June of 2016. Below is an elephant pin I made for my grand-mother in October of 2016. Long ago, the shells from the sea, porcupine quills, elks teeth, bone, bear claws, turtle shells and even dear hooves were used to make beautiful beadwork that accentuated dancers as they moved, beadwork that highlighted the accomplishments of tribal members, and even beadwork to mark milestones in life. As time went on, and trade grew seed beads, metals, and precious stones were incorporated to add even more creativity and uniqueness to regalia. I started beading in the summer of 2016. My first project was a medallion with the seal of the Muscogee Nation, my tribe I worked so hard on it and I am so proud of it; even in this short time, beading has taught me many lessons. I learned patience, and beading skills, but more importantly I awakened a spirit inside myself that is so passionate about beading; it drives me to learn more and keep making beautiful pieces of art. When I started this blog I didn’t know what direction I would go. Would I talk about my experience or would I ask other people about theirs? I decided to do both. I will talk about my beading journey and the tools and ideas that I have learned along the way. I will share some of the advice that I was given from people that are close to me and inspire me to keep going. And I will give a few tips that I use when I bead. So let’s get started. Picture it… American Indian Health and Family Services the summer of 2016. It was glorious…. I was new to working at the agency, mostly working with the youth group, and learning more about myself as a Muscogee Creek Nation tribal member. I did research about Native American arts and was honored to be able to learn how to make moccasins and how to bead. 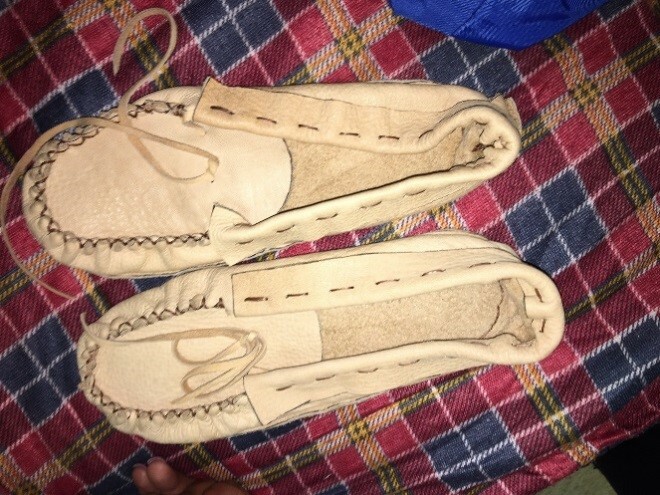 I have made 2 pairs of mocs and have beaded a number of things I am so proud to showcase my talent and be connected to my ancestors. When I first started to bead I took on a huge project-a medallion- and, at the time, I didn’t know how much work I would put into it. But now I see just how much work beading actually takes. I have a new found respect for beaders because beading is hard work. It really takes blood, sweat, and tears. I can’t tell you the number of times that I have pricked my fingers beading or the times I have been focusing so hard that sweat has formed on my brow, but it is all worth it to see my skills grow and progress each day. I watched a lot of YouTube videos to learn different beading techniques and I used Pinterest for inspiration on what to bead and what to use to bead various pieces. Learning to bead is one thing, but learning how to do edging or how to make shapes and letters is a whole different ball game. I remember the first time I did edge work. In all honesty, it was sloppy and had gaps, but now I make almost seamless edges and I owe it all to practice. Practice- even if it takes you 10 earrings to get the edging perfect don’t quit. Praise- give yourself praise whenever you are beading be proud of what you make. The last piece is an O, be Open to advice and critiques. 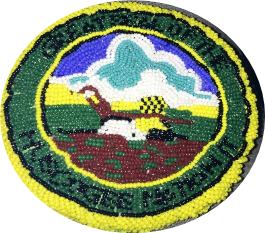 The people who really know about beadwork only want to help you be better and see you do well, so accept the advice and the help. I wouldn’t be able to call myself a beader without the help of the beaders in my life. So I would like to say Mvto (Thank-you) to Shiloh, Sarah, Christy, and Nickole for always helping me and sharing your wisdom with me. Join a beading class at your local Indian center or cultural center. If you are in the Detroit area, check out the men’s and women’s group at AIHFS or contact us to let us know you are interested in taking a class! We have lots of people willing to teach! 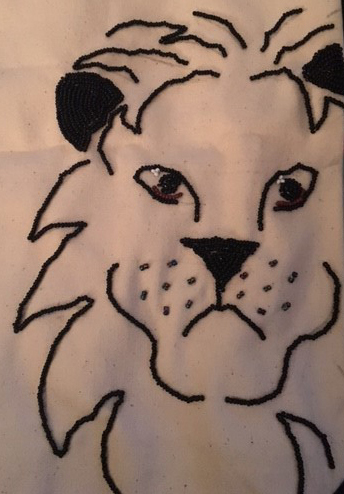 What steps will you take to pursue beading? Is there another passion you are thinking about pursuing?